Oh lord, did I just take a hit of acid? Did someone sprinkle some Acapulco Gold in my salad? Are you sure those were just morels? I'm feeling funny. Why am I giggling? Actually, there's a very good reason: I'm just cruising through ~MAGNOLIA GASTROPUB & BREWERY'S~ new website and getting lost in the illustrations. Delicious quirkiness. Dude, pass the pipe! 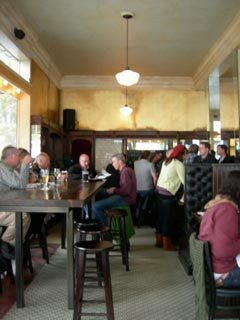 Magnolia has been a staple in the Haight for years, an oasis for the thirsty, the hungry, and yes, the baked. The place has quite the dappled history, including its days as "The Drugstore Café" (hence the Prescription Pale on the beer list) and then the period of 1967-1969, when it was owned by Magnolia Thunderp*ssy. (I can't write out her name or this week's newsletter will end up in everyone's spam trap!) She was a local burlesque performer who is the namesake for the restaurant, and the inspiration for the Dead's track Sugar Magnolia. When Ms. Magnolia TP owned the joint, she was known for her dessert delivery business, running until late at night ("the munchie hours?"). What's it gonna be, a Pineapple P*ssy, or the Montana Banana? For reals. Shame she's no longer with us. I was lobbying owner Dave MacLean to bring her desserts back. Or at least a variation of them, because I'm not sure how an exact rendition of half a pineapple filled with strawberry ice cream and covered with whipped cream, chocolate shavings, and a cherry fits in with the new Magnolia mojo. Ahem. The restaurant just celebrated its ten-year anniversary, and is now sporting a spiffy new look, style, menu, the whole shebang. I know some folks have been throwing granola at the changes, but personally, I am digging the update; there are plenty of grungy spots to hang out at on Haight Street--not all of them have to look like a co-op. Perhaps the most noise was over the famed hippie mural getting painted over, but it's not like McLean didn't care--would someone painstakingly photograph it, and eventually offer it as a downloadable panorama if they didn't care? Exactly. After ten years, he was just ready for something fresh. The space already had great bone structure (it was a pharmacy that dates back to 1903), but now it has a bit of a vintage East Coast vibe, with tall-backed and tufted booths ideal for small groups or a tête-a-tête, large mirrors with details of the menu (take a close look--no, you're not trippin'), subway tiling (especially in the bathrooms), a weathered-meets-gold leaf paint scheme, and there's now a communal table made of Douglas Fir wood from the original Levi Strauss building in the Mission. Chef Brandon Jew (Zuni, Quince, Pizzetta 211) has put together a menu of gastropub fare that is a celebration of SLO (sustainable, local, organic) and let's add an H in there for house-made. It's the new Slow Food: SLOH food. And it definitely has some modern flair and creativity--classic Brit pub fare this is not. Let's start with the munchies part of the menu (yes, that's what it says). It'll be leaving us soon, but the refreshing wedges of watermelon with saba and Maldon salt ($5) would be ideal as a mid-course/intermezzo. Say, post-boudin. 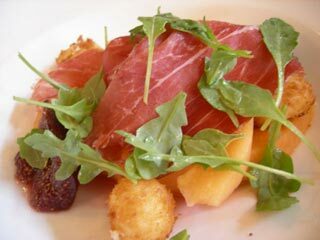 Or after scarfing the fried boar headcheese ($5) served with peppery watercress. (I know not everyone would scarf this dish, but kudos to Magnolia for having it on the menu--it disappeared off our table in a flash. Wow, nice trails.) We also got a taste of a scrumptious Scotch egg, not sure if it made it onto the menu yet, but it should be on there. The charcuterie selection is beer-friendly, and I like how share-friendly a lot of the dishes are, from the oh-so-lightly battered Monterey squid ($8) with squid ink aioli, or the lacquered duck wings ($7). But I'd like a wet towel after eating the wings; the Nopa-style dishtowels-as-napkins aren't quite enough to do the job after those sticky little buggers. Speaking of the dishtowels, one night I had quite the dingy-looking one--it needed to be retired and signed up for an AARP magazine subscription, stat. 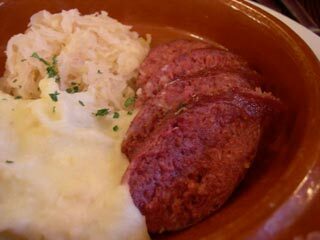 Perhaps one of the city's best deals for din din is the house-made sausage with two sides, for $12. The sausage selection changes a fair amount, but a favorite was the grass-fed buffalo, a chewy but flavorful sausage with deep seasoning that comes sliced up in a warm cazuela-like dish. Built for beer. The boudin, however, put me into a food coma, with its heavy breading. Sides to choose from include the perfect horseradish potatoes, with just the right amount of whip and kick, or house-cut fries (they're good--order them crispy), or sauerkraut--but I wanted the sauerkraut to have a little spin, like so many other dishes do on the menu. There are also seasonal vegetable sides, and speaking of non-meat items, there's a vegetarian sausage version on the menu, cool. What would a gastropub be without fish and chips ($15)? Uh, not a gastropub. The fish depends on what's the daily catch, but one constant is the flaky and light batter made with mead, and the pickled sea beans were a nice touch. I just wanted the malt vinegar in a shaker, and not the petite ramekin in came in--it's hard to dispense properly on the fries. Unfortunately on one night, the Prather Ranch burger ($13) was so not on its game: it was overdone, and the bun was soggy. Even the killer mustard and pickle couldn't elevate it. But then I have a friend who swears by the burger, so what can I say? Ah, the vicissitudes of restaurants. To that point, I have experienced some missteps here and there on Magnolia's menu during my two visits, like underdone beans or salty snapper, but they mostly felt like new menu kinks. Dessert also needs to get worked out a bit--one time a puck-like toffee pudding came with under-ripe nectarine, and the slice of the porter chocolate cake, while decadently delicious, was a bit precious for $7. The cubes of goat cheesecake ($7) were a tangy finish, with figs and honey, total hearts, but the topping of almond brittle was difficult to break into bites. Again, these are small tweaks that I am sure will get adjusted in time, especially considering the dessert history of the joint! So, about that brewery part in the name. The beers here are unique, crafted with love and obsession, and a pleasure to taste and try. I appreciate the brewski education you can get (do you know what ABVs and BUs are? ), and that you can compare cask-conditioned ales against beers on draught (do a taste test with the Blue Bell Bitter!). (You can read more about McLean and his passion for English ales in his wino piece here.) The names are clever (care for a Cole Porter? ), many referencing Grateful Dead songs, so the list is like a built-in drinking game. There are also some wines to choose from, or house-made sodas and complimentary filtered fizzy water for the teetotalers. Plus Blue Bottle Coffee anyone can perk up with. And ladies, if you want to hang with or perhaps pick up some beer-drinking lads, this is your spot--the chaps here are more the "thinking man's beer dudes," and not like the rapscallions you'll find at Murio's down the street. In fact, if you need a place to meet up with a fella on a date, say, date number one or two, this spot is on the money: it's not too expensive, the food is approachable, the interior has pleasant atmo, and while it's a bit noisy, there's enough going on that it doesn't feel like an awkward quiet DATE. And there's BEER, so you and the fella stay relaxed. And I also can't help but think the historical p*ssy power of Magnolia bodes well. NOTE: there is a popular brunch served all weekend, and the famous friend chicken is on Thursdays from 5pm until they run out.